If you hear water running constantly inside your toilet tank, the problem could be a leaky fill valve. These parts are inexpensive and easy to replace, so try to make your own repair before calling a plumber. If you see water around the base of the toilet, you may have a leaky water supply valve, which is the knob on the wall that controls the water flowing through a small hose to the toilet tank. 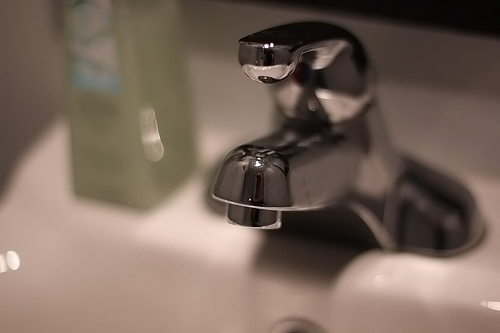 You may need to replace the water valve — again, an inexpensive fix. Just make sure to turn off your home’s main water supply before disconnecting the hose that leads to the tank. A clogged kitchen or bathroom sink can really disrupt your day. But there are plenty of methods you can try for clearing your drain before you call a professional. In the kitchen or bathroom, always start by plunging the clog. In dual sinks, put a stopper in the second sink before you plunge the clogged sink, and in a bathroom, block the water overflow hole before plunging. If plunging doesn’t work, try using a drain snake. And if that doesn’t get the clog, you can try detaching the pipes under your sink; you may be able to find the clog there, or at least be able to feed the drain snake directly into the wall, allowing it to reach further down the pipes hidden in your walls. Persistent or recurring clogs could be a sign of tree root intrusion in your main plumbing drain or a collapsing drain pipe. In that case, it’s a good idea to have a professional plumber assess the problem. Most homes have a one-handled faucet in the kitchen, but your bath may have a two-handled faucet. In either case, if the faucet handle is leaking, you will probably need to disassemble it to find the source of the problem (remember to turn off the water supply valves before tinkering with your faucet). Faucets have several parts — in a single-handled model, there’s a cartridge, retaining clip and O-rings. A double-handled faucet will have a packing nut, stem, O-ring and seat washer. O-rings and washers are susceptible to corrosion and are most often the source of leaky handles. Replace any worn parts and reassemble the faucet. Turn the water supply back on to see if the leak has stopped. In some cases, you may need to replace the faucet, which is relatively easy to do. Only tackle the tasks you feel comfortable with — if you have an old home and worry about damaging brittle pipes, by all means, call a professional. While hiring a plumber is expensive, it can at least alleviate any concerns you have about doing something incorrectly. Professional drain cleaners always know whats best to fix a clogged drain. Always hire them if simple solutions don’t work. I love the tips you gave here. I really love the way you presented the blog as well. Proper plumbing needs efficient planning and right materials. I don’t know a whole lot about the fill valve for the toilet. After I use the restroom, I hear the sound of a very loud air gasket for a long time afterwards. If I recall correctly, the sound lasts upwards of thirty minutes. Would tinkering with the fill valve solve this issue? I hadn’t thought about trying to plunge a clogged drain in the kitchen or bathroom. I usually think of plunging as something used only for toilets, but it’s good to know you can use it for sinks as well. I’ll be sure to plunge and unclog the drains in the way you advised next time I have a problem, but knowing me, I’ll probably end up calling a professional anyway. Thanks for the article! f you are suffering from problems with your plumbing, being your own plumber can be OK if you know what you are doing. But, often times this is not the case which is the reason why professional plumbers are in the plumbing business. Commercial plumbers can also tune up the heating elements, detect leaks, and replace corroded components of the water heater. These plumbers can check the temperature, CO levels, and water pressure of water heater systems, as well as the emergency shut-off valve. Never had a toilet leak, clogged drain or leaky faucet. But we did have a leaking pipe which ended up causing a lot of damage. Speaking out of experience, a leaking pipe can be very expensive if not discovered on time, thanks to the fact that we had home insurance we didn’t have to spend a penny out of pocket to fix the damage. The biggest headache of all though was having to deal with mold. It was very scary and for that reason I started a blog on general information about mold. I extremely recommend having any sort of water damage looked at immediately, it can not only cause damages to your house but if mold is produced it can also affect the health of everyone in the house. I have never had a leaking toilet, clogged drain or leaking faucet. But I did have a leaky pipe that ended up causing a big problem. A leaky pipe can can cause expensive damages if not uncovered promptly, what actually saved me from an unnecessary expense was having home insurance. I didn’t have any out of pocket cost to repair the damage. The biggest headache of all though was having to deal with mold. It was very scary and for that reason I started a blog on general information about mold. I extremely recommend having any sort of water damage looked at immediately, it can not only cause damages to your house but if mold is produced it can also affect the health of everyone in the house. When you tackle a plumbing problem yourself, there is no guarantee behind that work. If the problem occurs again, you have to do the same work again and may even need to buy new supplies to do it. A professional plumber will guarantee the work he or she does. By way of example, bear all around in your manufacture area of the grocery store and check out as well as learn what create in which someone will buy. Bathroom’s proper plumbing is really important. Better call real plumbers to get the best option on toilet plumbings. I like you post and it is very informative and useful for everyone. Plumbing problems are common in every house so for recovering from plumbing problems you should use good material. And make sure that taps are not leaking or pouring out. And you share great tips in this post which are very useful. Regular care and maintenance can forestall most of these breakdowns at a fraction of the cost of repairs. Have your plumbing cleaned and checked at least once a year. Progressive service companies offer these services for a modest annual fee. Plumbers who have been in business any length of time can and will give you references. If they cannot, or will not, then consider looking elsewhere. Talking with past customers is one of the best ways to accurately gage the quality of the plumber’s work. licensed plumber Hunterdon County NJ´s last blog post ..Hello world! Hi Felicia, thanks for the nice tips. I think these tips will be handy for people to repair their plumbing problems without calling for a help. These bathroom plumbing tips are highly useful. Keep posting such good stuff. Whenever you have a plumbing problem, it is not bad to diy the fix if you can help it. But if you can’t then it’s time to bring the professionals. Thanks for the tips. There are some tips of yours that I knew just now. thanks for that. Wow, I didn’t know that if my toilet made strange noises it could be leaking. I appreciate that you mentioned checking around the toilet for the valve before calling the plumber. Because I am not very savvy with things like this, it would likely be a good idea for me to call a plumber anyways. But I would want to shut off the valve before it gets worse. Thanks for this list of quick fixes. I’ll have to try replacing a leaky fill valve if I have a toilet issue. If there’s an emergency though I’ll call a plumber- remember plumbing issues can cause water damage so it’s better to get them seen sooner. Never lean over a septic tank opening or stick your head into tank to examine its interior — you could become overcome by gases, fall into the tank, and suffocate. Leave tank cleaning and repairs to trained professionals. Hi Karla and Felicia. Great post. While a persistently clogged toilet could be caused by a tree or a collapsed pipe, it could also be caused by caused by the way you use your toilet. Never flush anything but toilet paper and you’ll have a lot less clogs to deal with. Have a great weekend. Check Out La Porte Plumbers´s last blog post ..Hello world! I appreciated this post. It is very helpful to know when you have a leak and how to fix it. It can be inexpensive to fix parts of your toilet without calling a plumber and keep the cost down. Conroe Septic Pumping´s last blog post ..Hello world! I always tell my customers if they have a problem with a clogged drain they should try plunging or using a drain snake. If all the usual tips don’t work, then I have to come out because finding the clog may result in the need detach pipes to reach the clog or you may have a bigger problem all together with your main plumbing drain. Thanks for sharing such beautiful information with us.i hope u will share some more information about Quick Tips for Plumbing Repairs.